These are just some of the places a visitor (or a native) might wish to see in the vicinity. Most have been open at some time on Heritage Open Days if not at other times. 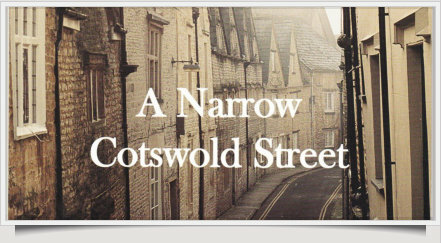 The Society supports Heritage Open Days, which has been run locally by the Cirencester Civic Society in recent years. Each year properties of interest are opened for free to the public at some point during the second week in September. Our Newsletter has published studies on buildings and private houses in the town over the years. We intend to add links to this work on this page from time to time, where the building still exists. 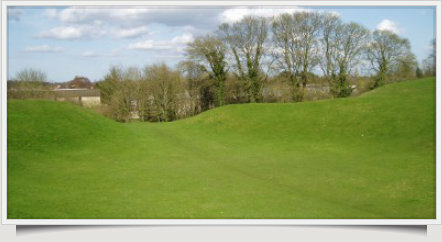 This extensive parkland behind Cirencester Parish Church was private land until the 1950s, when it came into the hands of the Urban District Council (now the Town Council). As the name implies, a large abbey stood here until Henry VIII seized all church lands for himself. The Abbey was torn down, it is said the foundations of many town buildings were made from its stones. Its outline is marked in stones set into the grass (our Millennium Project). A major project [not led by CAHS, but by a group containing several CAHS members] took place in 2017 to celebrate 900 years since the Abbey was founded in 1117. A leaflet describing the grounds is available from the Museum and Town council offices. CAHS recently helped funding two newer display boards in the Abbey grounds. The grounds also contain the only remaining part of the original Roman walls. The only remaining building from the abbey period is the “Norman Arch” at the northern end of the park. A good walk is to be had from here by crossing the dual carriageway on foot and continuing northwards into the “Hare Bushes”. The inhabitants of this street have written a book about it. It contains a number of older buildings, the Baptist Church in the middle, and a Wool merchants elegant house at the end. It is a fixture on the Deer Park School history course -six centuries in a few steps. The Baptist church is only a century and a half or so old, but if you get the chance to see, they have wonderful records. By the time you read this, the Baptists, having outgrown their church, have built a new one on Chesterton Lane. The original building in Coxwell Street will only retain its façade, as it gets converted into flats. There are dated buildings, and if you look carefully, a dated telephone junction box, but are they kidding? All well worthy of a browse. Round the corner to the right from the Merchants house we continue the nonconformist theme. Built in 1673 the Meeting House has been in continuous use ever since. One of the earliest of such buildings in the country, it has changed little over the centuries. 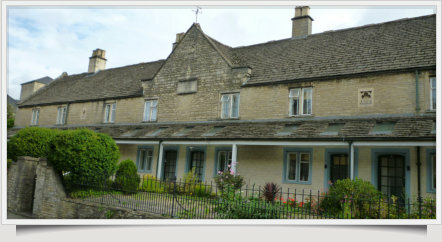 Cirencester Quakers have had a considerable role in the town’s history. The large garden at the rear of the building was formerly the burial ground. The graves are still retained and a plan of the graveyard can be seen – the garden now forms a peaceful oasis amid the surrounding busy streets with a good view of the Parish Church and an attractive herbaceous border. You will find the Quakers very conversant with the history of their building, should you get into conversation. Just across the road we find the Salvation Army in what was once a Temperance Hall! If you visit during HODs (above) they put on a good display of their history. Nearby is the Weavers Hall, probably the earliest secular building left in the town (and probably the oldest almshouse charity in the town, too). Other buildings are worthy of note. Old Unitarian Chapel (Anglican Parish Rooms) Gosditch Street Continue to the end of Thomas Street and turn right. Some hundred yards or so on the right, just past a furniture shop is an entrance. Down this alley you will find the old Unitarian Chapel, now reused as the Anglican Parish Rooms. Non conformity in Cirencester dates back to the English Civil War period and the Chapel’s early founders played a significant role in 17th century events. The rooms have a rich history and have had a key impact in the development of Cirencester’s non-conformity. 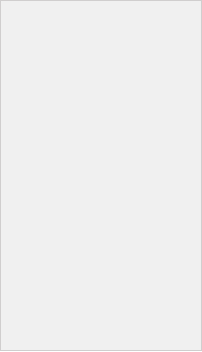 The exterior retains many original features, but the interior is much changed. An article in “Gloucestershire History”, An Old Cirencester Chapel by Fred James records the story. This view from the graveyard brings home the many phases of this building. The usual view from the Market Place shows the Town Hall or South Porch: a unique Grade 1 listed building of the 1490s. The Church cares for this secular structure which has been used by the people of Cirencester for over 500 years. Both church and porch have completed major renovation recently. Guides are available, consult the desk in church. If the day is clear, do go up the tower (if open). There are articles in our Newsletters nos 8 and 9 about the church and churchyard, sadly not in print. 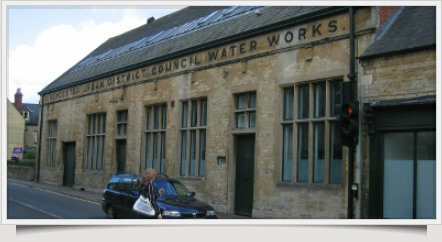 The Cirencester Water Works Company was founded in 1882, but the building is probably slightly later. While sewers were apparently constructed slightly before then, there was no power to make occupants connect to them (as now!). The water became tainted from infiltration and the waterworks moved to Baunton in the 1930s (where it still is, though the supply is now augmented from elsewhere). The waterworks building had a number of later uses and is now part of a scheme of flats including the adjacent feed mill. We do not have a history of utilities yet, perhaps we should... We did have a gas works; did we have an electricity works? What’s with the blue bike? 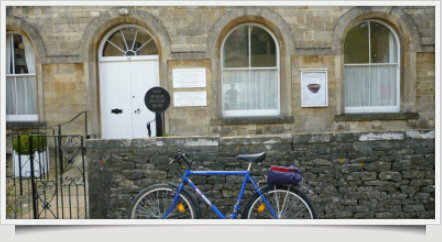 You may have noticed a blue bike in some of the ecclesiastic building pictures. Heritage Open Days Saturday always coincides with a Charity Bike ride around all churches for Gloucestershire Heritage Churches Trust. Riders are asked to visit as many or as few churches as they like. You can also walk, ride a horse or maybe a scooter (We have met a mobility scooter in a country churchyard, but do not recommend the mode of transport!). 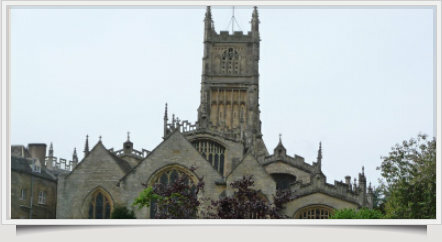 Why not take a stroll around all the churches and chapels of Cirencester to raise funds for your church. There are more than you might think, especially if you include those no longer in use. Ask the Salvationists where they have worshipped over the years. St Mary’s Abbey The Old House, Gloucester Street. 33 Dyer Street The Obelisk Chesterville School Kings Head Other articles discuss uncertain locations or multiple locations. Browse our Publications for more. 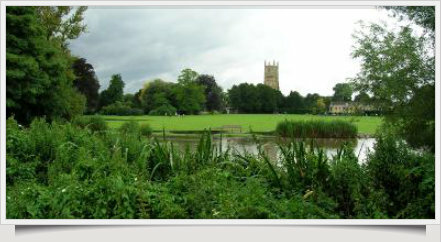 This extensive parkland behind Cirencester Parish Church was private land until the 1950s, when it came into the hands of the Urban District Council (now the Town Council). As the name implies, a large abbey stood here until Henry VIII seized all church lands for himself. The Abbey was torn down, it is said the foundations of many town buildings were made from its stones. Its outline is marked in stones set into the grass (our Millennium Project). A major project [not led by CAHS, but by a group containing several CAHS members] took place to celebrate 900 years since the Abbey was founded in 1117. See the Abbey 900 page A leaflet describing the grounds is available from the Museum and Town council offices. CAHS recently helped funding two newer display boards in the Abbey grounds. The grounds also contain the only remaining part of the original Roman walls. The only remaining building from the abbey period is the “Norman Arch” at the northern end of the park. A good walk is to be had from here by crossing the dual carriageway on foot and continuing northwards into the “Hare Bushes”. With the Abbey 900 project coming up, we have highlighted some of the early CAHS publications on their own page. Round the corner to the right from the Merchants house we continue the nonconformist theme. Built in 1673 the Meeting House has been in continuous use ever since. One of the earliest of such buildings in the country, it has changed little over the centuries. 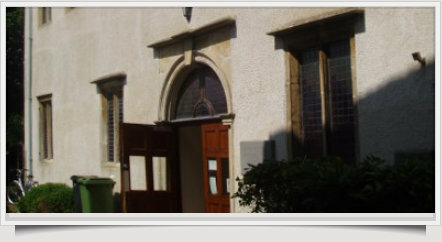 Cirencester Quakers have had a considerable role in the town’s history. The large garden at the rear of the building was formerly the burial ground. The graves are still retained and a plan of the graveyard can be seen – the garden now forms a peaceful oasis amid the surrounding busy streets with a good view of the Parish Church and an attractive herbaceous border. You will find the Quakers very conversant with the history of their building, should you get into conversation. 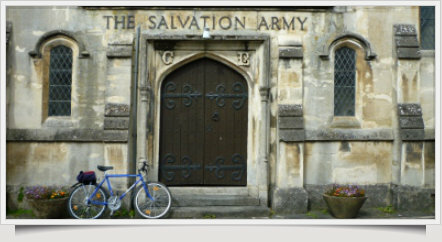 Just across the road we find the Salvation Army in what was once a Temperance Hall! If you visit during HODs (above) they put on a good display of their history. Nearby is the Weavers Hall, probably the earliest secular building left in the town (and probably the oldest almshouse charity in the town, too). Other buildings are worthy of note. Old Unitarian Chapel (Anglican Parish Rooms) Gosditch Street Continue to the end of Thomas Street and turn right. Some hundred yards or so on the right, just past a furniture shop is an entrance. Down this alley you will find the old Unitarian Chapel, now reused as the Anglican Parish Rooms. Non conformity in Cirencester dates back to the English Civil War period and the Chapel’s early founders played a significant role in 17th century events. The rooms have a rich history and have had a key impact in the development of Cirencester’s non-conformity. The exterior retains many original features, but the interior is much changed.